The labels are resistant to standard ethylene oxide gas sterilization, consisting of a 60-minute exposure to 759mg/L of ethylene oxide gas, at 55°C, and 40-80% relative humidity, followed by a two-hour aeration cycle. Use XAR-Class (Xylene Resistant) resin ribbons. 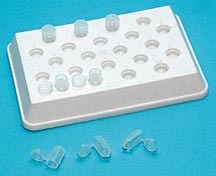 BEEM® pioneered the development of certain TEM specimen preparation products. Their embedding capsule remains a standard product for routine EM. Preformed capsule tips in the shape of a truncated pyramid with a flat 1 x 1 mm face at the end reduce trimming time and produce cleaner surfaces. A hinged cap is used for closure or may be used for making flat-tipped molds. Hardened blocks may be removed using a BEEM® Capsule Press. 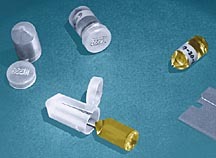 Filling the capsules is made easier with BEEM® Capsule Holders (#132, 132B). Capsule size 00 is preferred, but for specimens with certain shapes (long, particulate) see BEEM® bottle-neck or conical capsules. For smaller specimen sizes, a smaller capsule size is available. Polyethylene capsules have long been preferred in standard EM resin preparation. Acrylic resins and UV polymerization technology have increased the use of gelatin capsules. BEEM®Embedding Capsule 00 Produces blocks 7.9mm OD. BEEM®Embedding Capsule Size 3 Produces blocks 5.6mm OD. Polyethylene, hinged cap. Same design as 00 size, only smaller. For size 00 BEEM® capsules, 22 numbered cavities. 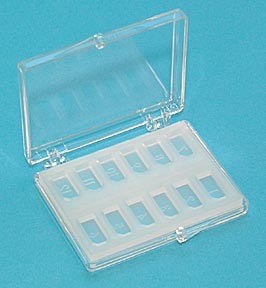 Also holds gelatin capsules. May be illuminated from below for orienting specimens. For embedding specimens requiring flat or en-face orientation in capsule configuration. Inside dimensions are 00 size: 7.92mm dia x 18.87mm deep (0.312 x 0.743"). Outside diameter 9.6mm. The service temperature: polyethylene capsules is 65°C, polypropylene is 100°C. 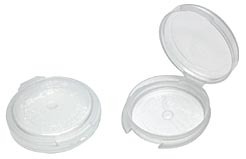 Clear, 26mm (1.02") ID, 10mm (.39") H. Hinged snap cap closure. 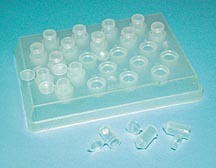 Virtually transparent polyethylene mold provides excellent visual contact with specimen due to transmitted light. Being able to see your specimen better allows you to align it better. This mold produces smooth, polished flat blocks. Reusable; shipped in plastic box.